Disabled People are the First to Die in Disasters! This Site Can Save Your Life! People with a disability have faced physical disasters since the beginning of their disability. It’s a long and difficult road to travel. I find that their inner strength grows just like our muscles grow with physical exercise. The same growth happens for anyone whether they are able-bodied or disabled when even a minor disaster comes along. That is the exact reason why we have created this site to prepare you all by providing resources, information and direction to help people survive when disaster strikes. Sometimes just knowing who to talk to or where to find things can save lives. The realization that the government is not properly prepared to protect the disabled in any real disaster should be enough to motivate us into preparing to take care of themselves to the best of our ability. The directions we offer and the tools we recommend will make it that much more likely that you and/or your family will survive. We all know just how frightening disasters like wildfires, floods, storms, and earthquakes can be. Horrible photos are thrown in front of us by the news media almost daily to keep the pain and suffering on our minds. You know the old saying,”if it bleeds, it reads”. Now lets really scare ourselves by adding in the possibilities of things like war, terrorism, plane crashes, sink holes, mud slides, tsunamis, and a multitude of other disastrous things that can happen in minutes and can put our lives in peril. This is in truly a scary world that we live in. The fear of the disasters is magnified without preparation. On the other hand, if we pay attention and properly prepare for a disaster, the fear is likely to subside as your knowledge grows. The first step in preparation is largely a mental exercise. We search, we read everything on the subject that we can get our hands on. We need become active and involved members of groups with similar concerns. When you do these things, your likelihood of survival drastically increases. Everyone needs to be prepared but people with disabilities must be doubly careful. Take every bit of information on survival and use it to create your specific plans live. Then you must become so familiar with the techniques for survival that you are completely prepared to put these plans to work when the emergency arises. Once you have solidified your plans the second step in adequate preparation is to make sure that you have the food, water, and tools to survive. Don’t forget to buddy-up! In a real minefield, the danger is all around the people that must cross through it. I have used the term disaster mental minefield because the real danger is right there in front of us. We must step very carefully. Just like in a minefield, you may only get one mistake that can cost you your life. The last step into the disaster mental minefield is to imagine yourself in a wheelchair, or if you were perhaps blind, elderly, or really disabled by any physical or cognitive problems that would put you at the mercy of the disaster at hand. Persons with disabilities, if properly prepared, loaded with knowledge, having their survival tools on hand before the disaster hits, can survive as well as anyone else. While you ponder these things, to try to imagine how much more frightening these disasters could be if they involved you, your family, or friends. Statistics show that in most, cases, the government’s plans for rescuing the disabled or elderly, fall short and need to be massively improved. This is the primary reason is that percentage-wise, this segment of the population is often in the most danger. Disasters are a horror that can face us all at any time and totally without warning. The danger is extremely magnified for people with disabilities. These are terrible situations that one could not handle without the help of other people. Once again, that is why WE are here! We are going to help you increase your chances of survival by eliminating the fear of being unprepared. There are standard procedures and guides for various situations that need to be read by everyone. The problem is that there is so much information that we often find ourselves looking for a needle in a haystack. Our intention here is to boil it down so that it is much easier for you than researching the entire internet and then giving up in frustration or perhaps getting the wrong information to ensure your survival. Whether you are of normal health and capabilities or you are a person with disabilities, PLANNING AHEAD IS ABSOLUTELY ESSENTIAL. If no adequate planning has been done, when an emergency arises, the panic mode sets in and it is rapidly followed by poor and uneducated decisions. These are the times when many lives are needlessly lost. When careful planning takes place and we follow the plans that we come up with (to the letter) the risk to life is greatly reduced because we have prepared for and practiced for just such disasters. We know just what to do to be as safe and prepared as possible by thinking with a clear head. To make this work for you, read through this site, pick out the subjects you feel fit your situation, and start putting your plan to paper. Next, with the help of some friends make sure that you don’t miss anything important. Another set of eyes will always find the things we have missed in our personal planning. This in itself will save lives. Once you feel secure about your escape and survival plans, they need to be practiced until they become second nature. Otherwise, you could end up in a dead-end alley. Not a good place to spend the rest of your disaster. There is yet an additional insidious danger lurking just out of sight. Many people, especially those who do not live in a 3rd world country, feel so “safe” in the world around them, that making plans as to how they should respond to any disaster just never enters their minds until it’s too late! Then the danger to life and limb is compounded all the more. Please believe me that things can get much worse than you can imagine in a matter of minutes. The person that wants to be prepared should begin by seeking the advice of people in their support group, available survival publications and local authorities on local emergency planning and of course spend some time cruising this site. You don’t want to miss anything! When you begin your plan, write it out using the information you found in your search. I suggest you do so with double spacing (there will be a lot of changes as you proceed), a pencil, a thick pad of paper, and a big eraser. When it comes time to mark your maps for your escape routes, you should mark them with permanent waterproof colored markers like sharpies but not until your plans are finalized and run by your friends. For example, you might mark a danger zone in red on your notes or maps. Use the flexible water-proof maps that are available for your area if you can find them. Now while your coffee is warm, the air is clean, there are no flames or rising water, you can take your time and make some very good plans. Let’s get started. By the way, I am not a special forces guy so if you see mistakes or have some ideas you would like to share, please do so in the comment section below. I would love to hear from you! When you have planned for as many things as you can think of, and when you have mapped your escape routes and rendezvous points (on scratch paper, mark your maps last) and you are positive there are no mistakes, you should give copies to anyone who you feel might be able to help in case of an emergency. Try to avoid low-lying areas especially if it is raining. I prefer the highest topography I can find. Not only do I stay dryer and out of possible flash-flood areas, but up high I can see who is coming. Then you and your friends should review the plan again together. It is better now than later. Sometimes people have only minutes to safely get out of the house, apartment, office, and neighborhood. Avoid any form of mass transit. They many times have no idea as to what to do or where to go like most people. Trains and subways are scary too. Remember I said CAREFUL PLANNING. Do your best to leave no details out. Keep your gear as close as possible to the door you will lock last as you leave. It is sometimes argued that people with disabilities should plan to turn their dwelling into a little fort. I have mixed emotions about this. This is a serious subject so it deserves careful consideration if you or a loved one has a disability. Unfortunately, sometimes it is not even an option. You know, if it is underwater, on fire, or just missing, I wouldn’t bother with trying to turn your home into a safe haven. You will need a fallback plan and regardless of what you choose to do, you will no doubt still need these things below to be safe no matter where you are. A bug-out-bag is any easy to carry pouch or backpack. It is intended to carry your personally focused items that YOU need. It is intended to be small enough to be carried even by a child but big enough to carry items essential to your survival. This is NOT what you want your bug-out-bag to look like. What Do You Need In Your Survival Kit? The object is to survive, not live like royalty. You won’t have much space so you will have to minimize but you should have at least the basic supplies listed below. Order and forethought will prevent this type of mess. We have included below a significant list of the items you will need. Almost everything in our list has a convenient link so you can find it quickly to read more about it or to purchase it. I use these items myself and have found them to be reasonably priced and of good quality. You can also use our list to find the necessary items in your home to save money. Each person should have their own personalized smaller bag. Then if there are others with you, much of what I show you below can go into backpacks. This “Shopping List” below will speed your search considerably. We decided that we would not assemble a “full kit” since everyone’s needs will be a bit different. You probably have a lot of the standard items sold in a “Kit” so you can check out the list below and choose only the items you need and don’t have rather than buying more of what you already have on hand. Water: Safe requirements are 1 gal. per person, per day (3-day supply if you evacuate, 2-week supply if you stay at home). Realize that this is a lot of weight. Water jugs make great area lighting. Just use one of your flashlights, tape it to the spout or the side, pointing into the water and say Wow! Important: A human can go without food for about three weeks but would typically only last about three days without water. The US gallon, which is equal to approximately 3.785 L, is legally defined as 231 cubic inches. A US liquid gallon of water weighs about 8.34 pounds or 3.78 kilograms at 62 °F (17 °C), making it about 16.6% lighter than the imperial gallon. This is the primary reason I suggest the garden wagon at the end of this list of essentials. 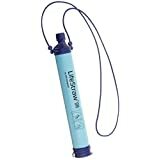 LifeStraw: A Lifestraw is a personal water purification device that advertises that it will filter out 99.99% of the contaminants out of at least 1000 liters of water. If there is lots of water around you could use this for your drinking water rather than drag lots of heavy water jugs around. You will need 1 Lifestraw per person. This would work quite well in most climates. Deserts for example, even in the southwest U.S. are not totally dry so you can pack both the Lifestraw and some water just to be on the safe side. In a post that will soon follow I will give you some interesting and easy to do tips to survive better. I will even show you how to get good drinking water in the summer in the desert. Food: non-perishable, well sealed, individually wrapped, energy bars that won’t melt, etc. (3-day supply for evacuation, 2-week supply for home). Not exactly the food your Momma wants you to eat when it comes to nutrition but they will keep you alive. A variety keeps you from getting bored. Homemade trail mix is a favorite of mine. Cooking is good if you want strangers and animals to seek you out. The scent of fresh fried Spam gets them coming in droves. You can pack a couple of inexpensive Mess kits if you need to cook. Personally, I can live a long time on energy bars and such. They don’t attract attention and save you lots of space. You can eat your Spam, canned (or bagged) tuna, or canned (or bagged) chicken cold. Keep it sealed until you are ready to eat it all otherwise it will probably get contaminated and make you sick (or dead). Also, make sure no food, gummies, granola bars, I mean anything edible is left open. The animals will be hungry too. We usually put anything edible into a pouch. Then we take some paracord with a rock tied to the end and throw it over the highest limb we can and then hoist the food pouch up out of the reach of bears, teenagers, and oh yes, tall hungry angry bearded men. Personal Locator Beacons: One of the things I suggest as an extra safety feature in your planning is to add a PLB (Personal Locator Beacon) to your survival tools. If you are in a disaster of any kind you can activate your PLB to help the first responders to get you as quickly as possible. Click HERE to read more about Personal Locator Beacons. A Faraday cage is just a metallic shield to protect almost all of your electronics from the EMP (Electro-magnetic pulse) or Solar Flare. Until the emergency actually happens, I would also recommend that you keep your electronic devices tightly wrapped in a baggie, then a thick layer of brown paper bag or cardboard, followed by at least a double layer of aluminum foil, duct taped tightly, and lastly followed by another ziplock bag with the seal duct taped securely. Pocket Flashlights: Flashlights Have 2 (minimum) in case one wears out or gets damaged and put one in your foil sealed bag. Not the little tiny flashlights or the great big ones. The ones I linked to I use daily. Extra batteries: For the flashlights, you can use 3 good AAA batteries each and make sure you have spare batteries for everything. I recommend this set of 6, 18650, 3.7v lithium rechargeable batteries that comes with their own charger. They produce a brighter light that I feel lasts about 3 times as long as the AAA’s do. Again bring extra batteries for everything. You should also consider at least 1 set of rechargeable batteries. First aid Kit : Study First Aid Kits carefully. You probably don’t need a full surgical ER in your backpack. I chose the one linked right above. It has a nice sturdy case and 250 items. OSHA rated for 50 persons. Let me explain, first of all, this is a GREAT PRICE. Secondly, you probably want extra stuff in case you (being the Good Samaritan that you are) decide to help someone else. You can use common sense to put your own kit together but since I am just lazy I thought this one was quick and easy. Oh yea, carry a nice thick piece of leather to bite on cause ‘dis might hurt a little. (you know, like in the cowboy movies) you used to watch TV, right? Multipurpose tool : What is a multipurpose tool? You know one of those outdoors type knives with some of everything folded in. Get a good one with as many tools on it as your can afford. If you are alone 1 is good otherwise 1 per adult. This is an example of quality Gerber tools. Personally I also like to carry a big, scary, folding pocket knife for general use and an even bigger and more scary hunting knife out in the open. Hunting knives an be tied to a fairly straight stick and used for hunting or warding off angry hungry bearded strangers or animals that threaten you. A Sewing Kit: A sewing kit can fix your pants or sew up a life threatening wound.Who knows what or who you might need it for. I have even seen people fish with it. Strong thread is recommended as well. Cell phone with chargers: I suggest a separate solar charged battery. Most of these will charge 2 items at once. They will run your laptop or cell phones, or charge your 2-way radios. This is rated at 50,000 mah (milli-amp hours) that in normal human terms means it will last thru the ball game and the sitcom for the family. The solar panel is built right in as is a bright LED light that also sends an SOS signal that can be seen at great distances. All of this for less than $27.00. Love it. I carry 2 of these. A Good Sharp Hatchet: Hatchet, not an axe, just a tool for tent stakes, driving nails to put you tent rope up with, to hang your notes and trail markers, and for firewood. You know just an easy to use all-purpose hatchet or weapon. Non-breakable handle, nail puller, and SHARP. Orange so you won’t lose it so easily. Emergency blanket : These emergency blankets are great. These are big enough for 2 people to share. (ten per pack). If you are in a warm climate these work by themselves but are not so comfortable to lay on all night. I love my sleeping bag but in cold or wet weather you can put your sleeping bag or blankets inside the emergency blanket. You’ll stay toasty and dry. General items like hearing aids with extra batteries, spare glasses, contact lenses, syringes, tourniquets, rope, etc. I use 550 paracord for most needs instead of rope and it doesn’t take up much space. This stuff is strong, durable, and bright orange so you can see it and you don’t clothesline yourself or others. 100 feet in this package. You should also bring some extra insulated wire. There should be plenty of lamps or other appliances not in use where you can scavenge it. Soap: All purpose soap for the body, soap for kitchen utensil clean-up after cooking. Plastic bottles of course. For kitchen type clean up you can take your nice hatchet or a rock and crush the end of a stick. Use the crushed end to help clean your mess kit. For more difficult, perhaps burned on stuff, just throw some sand in as a cleanser. Mind you this will ruin your non-stick surfaces but that is a lot more pleasant than dysentery. 12 Volt DC Power Inverter: An inverter connects to any 12 VDC source, like the thousands of abandoned cars setting around and converts it to 120AC to perhaps charge a wheelchair. This model also has 2 USB ports so you can quickly recharge your solar battery or other electronics in the absence of good sunlight or run your laptop and charge your mobile devices. MAKE SURE YOU BRING CABLES FOR ANYTHING YOU WANT TO CHARGE. Be sure to include radio codes. By this I mean you should use a code that you denote in your plans to be able to change channels for your rescuers to find you while secretly hiding your radio transmissions from the bad guys. For example, you may choose random channels and then Identify them in your plans as channel A, B, or C. That way when you tell your family or rescuers to go to B, they will know what channel to go to and the bad guys won’t have a clue. Practice intensely or you won’t have a clue either! I have my secret channels spread out over the range of channels available on our 2-way radios. That way if someone hears our transmissions, and we change to secret channels often, only the people who have our code will be able to hear us. If you need help with this there are many HAM Radio clubs (& ARRL) all around and they are great folks to have on your side. They will gladly help set things up for you and teach you the basics. Again be on guard. Don’t just answer anyone who calls to you. Be sure that you designate a stand-by channel in your plans as well. Perhaps multiple stand-by channels. Keep your radio batteries charged. Usually spare batteries are relatively inexpensive and easy to find from the radio manufacturer. I got mine when I purchased my radios from Amazon. Cheap Surgical type masks: masks to protect you from breathing smoke or dust. Eye Protection: A pair of flexible goggles that won’t break easily (like the ones you use in the yard or garage) for each person. Rain gear: A 5-pack of longer hooded lightweight raincoats. These are kind of thin so they don’t take up much space but depending on your climate, you may want something heavier. Sleeping Bags: There are only about 15 gazillion sleeping bags out there. This one is inexpensive, w arm, water-resistant, light weight and packs up into that little bag on the right there. Compass: You can install a compass app on your phone but nothing beats a good old mechanical compass. No batteries required. These are designed to work well with maps. A few large canisters of Bear Pepper Spray: Bear is not the name… it is to repel bears. Does a pretty good job on ugly dogs, coyotes, rabid animals of all sizes and large angry bearded men. Inflatable Pillows: These pillows take up little space and are cheap but the bottom line is that some extra clothes or towels work well too. Even a roll of news papers with a rubber ban or a piece of that paracord to hold the shape will work. Large roll of aluminum foil: AluminumFoil to protect your stuff on the get-away or cover your windows at home so you can have a better chance of making people think you are not home. It can protect your electronics at home too. Even that 80 inch 4k TV you just bought. I would just take a portion of foil on the road if walking. Leave the TV behind. Backpacks: Backpacks are a necessity. One or more can even be attached to a wheelchair. This is an item where you really don’t need a brand name just to get the price higher or that super-cool logo. Adults should plan on a full size pack. If there are children, a small child can carry a lot of essentials like underwear, socks, cloth diapers, and toys. SAFETY Whistles: Safety Whistles at least 1 per person.Make sure the kids have one and know how and when to use it. This one is not a toy to drive adults crazy with. They should be worn at all times by everyone in your family. If a person loses sight of a family member they start blowing the whistle to find one another. Remind them not to cry wolf. Medications: Carry a 7-day supply of your prescribed meds. If you are on the move or if you are staying at home have a 2-week supply and additional medical items if you need them and your First Aid kit doesn’t contain them I suggest you add aspirin (over 25 years old ONLY), Tylenol, or Ibuprofen if it is safe for you, a bottle of isopropyl alcohol, a bottle of hydrogen peroxide, and a good antibiotic cream. Many people who live through the disaster itself later die from sepsis from little cuts or scrapes that get dirty and then very infected. Any cut or scrape needs to be treated seriously and it should be cleaned with soap then rinsed thoroughly. Apply antiseptic or antibiotic applied to the wound. If the cut or scrape is low on your body, like feet or lower legs Then dry the area around the wound and wrap the injury with duct tape to keep any nasty water out. Not too tightly and change it often. This seals better than band-aids, etc. Extra Cash: Strictly up to you again. I can only recommend coins and smaller denominations of paper money. Precious metals are your best bet. Be prepared to barter. You can’t eat money or gold so in just a few days money will basically be worthless. “Booze and bullets” are the prepper’s best bartering currency. Even if you don’t use either they will be almost as valuable as cigarettes. NEVER barter your food away. Better yet, NEVER tell anyone about anything you have. Games and activities for children: I just make my kids stand guard for entertainment. I rent my playing cards out to them for gummies. Same with that old cell phone full of games. Extra clothing: For example a hat, gloves, and sturdy shoes. Decide by climate. Cloth Towels: Even a couple of rolls of paper towels. They all can double as wound dressing held on by duct tape in emergencies. Baby supplies: Bottles, formula, baby food, diapers. You can make them stand guard or crawl the camp perimeter if they aren’t walking yet. Extra set of car keys and house keys: (2 sets between 2 adults). If your keys have an electronic entry or starter button, you should wrap them in aluminum foil just like your other electronic devices. In the event your vehicle is still there when you get home it would be nice to drive it to the store to replenish your supplies of everything. Matches: In a sealed pill bottle or like me, I just carry some Bic lighters. Paper: For notes and eye-catching posted messages to friends. A few (8.5 x 11.0) pads of bright writing paper and perhaps a pack of day-glow orange or yellow paper to help people who may be looking for you to find you easier. Note on your plans what color rescuers will be looking for when they search for you. You may not want to write your plans and post them publicly, but if a friend knows you have for example blank day-glow orange trail markers (folded to make trail pointers) they can follow the route you took. Duct Tape is Your Friend: Take several rolls of duct tape with you. You can fix anything with duct tape. Enough said! A Package of Nails: To hang your trail markers or use them to attach your tent rope to trees, etc. Pets: Should be tied to your foot at night, never outside alone. Some folks say they are very tasty if one is hungry enough. Besides that, even a small pet makes for a good proximity alarm. Plastic sheeting: A 10′ by 20′ package of at least 20 mil plastic construction or painting sheeting. Use it for many things including shelter or even gathering water, even in the desert. Leave it sealed in the bag until you need it. A signal mirror: This can be found a most any surplus store but a signal mirror can easily be made by taking an old compact mirror out of the case, drill about a 3/8″ hole in the center of the case where the mirror was. Then push the mirror back in and use a pencil or marker to mark a circle on the back of the mirror. Next you can take the mirror out again and scrape the reflector off of the mirror inside the circle you marked. Hot glue the mirror back in. Voila! you now own a signal mirror complete with pink carrying case. Guaranteed the one from the surplus store won’t be so fancy. Just look through the hole with as bright a light as you have available hitting the mirror. You will easily be able to see the point in the distance where you need to signal to. Whew! Household liquid bleach: You can sterilize to your heart’s content and use it to treat questionable water. It is usually only about 3% bleach so it’s pretty safe. Entertainment items: Things like playing cards or dice. You can gamble like there is no tomorrow (I know, not funny). The money is worthless by the time you get bored enough to gamble. After world war II the Germans used their paper money for fires to stay warm. That old extra phone can have hundreds of games on it. Weapons: Solely At your discretion for obtaining food or for self-defense. NEVER show your weapons. Someone ALWAYS wants your stuff and they often have bigger better weapons than you. Many weapons can be made on the trail as you leave town if you feel they are necessary. Everyone should have a pointed walking stick to help over all kinds of terrain. It can also be used keep animals or large angry bearded men away. That Bear pepper spray also works well. I’ll stick to the guns and pepper spray. Your choice. Copies of personal documents:These should include medication list and important medical information, driver’s license or state ID with photo, proof of address, deed/lease to home, passports, birth certificates, insurance policies, copies of you evacuation maps, clearly marked routes and rendezvous locations. Keep these and anything else you think of in the double zip locked bag mentioned above. Sanitation and personal hygiene items: I’ll let you figure your personal needs here. Toilet paper and lightly scented wipes at minimum. One thing cool for us guys is no toilet seat to always put down. Do everyone a favor, take a stick of deodorant too. Tooth brushes and flossers will feel great. You can use baking soda for toothpaste or even ordinary toothpaste. Your companions will be very appreciative. Garden Wagon: Right about now you are probably saying we can’t carry all of this stuff but an inexpensive garden wagon will probably hold everything for several people. It can even be hooked up to a strong power chair for those times when you need a break. This one has removable sides and will hold up to 1,400 lbs. Hoard everything because it is up to YOU to protect yourself and your family. Hopefully you won’t have to defend yourselves but if you do, that piece of broken pipe you picked up just might save your lives. Be ready to use your pepper spray when any strangers are near, especially if you ask them to stay back and they just keep coming at you. I would use the 24-foot rule at a minimum. I saw some armed police officer training video where a guy with a practice knife covered 24 feet before the officer could draw his weapon. Good thing it was a practice knife. Almost anyone can and will take from you your stuff or your lives if they decide they need your stuff worse that you do. Real life can be so much worse than scary TV if you haven’t planned for every scenario you can imagine. You do watch TV right? The plan is designed to keep you alive. I know that this list sounds like a lot of stuff to carry around but in the event you need it you will wish you had not just skipped that item. Of course you can use some of the items as dual-purpose items and perhaps save a bit. If you are fortunate you may find some friendly fellow travelers who perhaps can help with the load. There is always more safety in numbers anyway. The sales from this site will help us to continue to save lives. We thank you for visiting and we hope that you will feel rewarded for your time here. We encourage your comments and inputs along with notes on things we might have missed or good ideas you may have come up with. Heads up and God Bless! I am a retired Senior Development Engineer for Hughes Aircraft Company. I retired from Hughes In 1997 and moved to Phoenix with my young daughter to be with my two older sons attending Arizona State University. I am a former member of the U.S. Air Force where I was an active member of the 95th Fighter Interceptor Squadron.